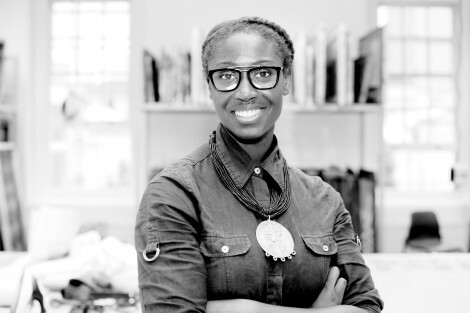 Currently in the midst of preparing to show at Milan Design Week next week (14 – 19 April 2015), we caught up with MA Textile Design graduate Chrissa Amuah, to find out how she is getting on. 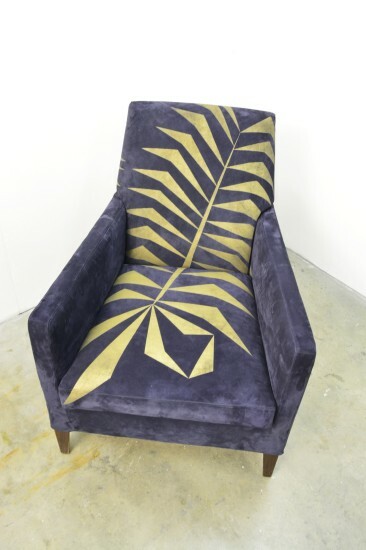 AMWA Designs, which is founded by Chrissa, is built upon the principle that our homes should be enveloped with beautiful furnishings, evoking powerful and positive thoughts within us. 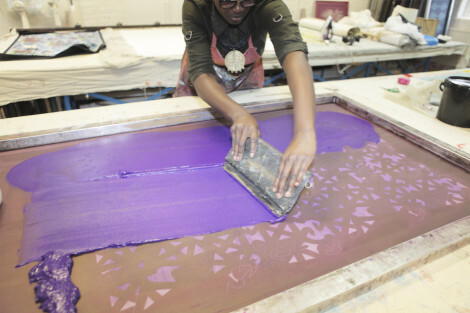 Combining a range of techniques and materials to create prints and designs that inspire empowerment, positivity and well-being (to name a few), Chrissa uses Adinkra symbols of Ghana, West Africa, to inspire her work. Can you please describe your time at Chelsea, how you developed and what you gained from the course? I will always look back at my time at Chelsea with great fondness. That said a lot of it, in hindsight, feels surreal. I can’t believe how much I learnt, in a year, about myself, about learning and so much more. Learning from the technicians, academics and other students across the various courses opened my mind and practice in a way that I had not anticipated. The sustainability focus of the course has reshaped my thoughts and actions as a fashion and textiles consumer. The reward of thoroughly applying myself to the MA Textile Design has given me a deep sense of pride and satisfaction that’s difficult to describe. I’d encourage anyone to try and experience it. Why did you choose to come to study at Chelsea? My main reasons were its reputation and location; I needed and wanted to remain in London. Also, Chelsea has a pretty impressive alumni roll call, joining the list is pretty sweet. Your textile designs are fascinating- how have you developed your style and why did you choose the Adinkra symbols as the leading motif in your work? Thank you. My style continues to develop by learning as much as I can about techniques and materials. I love texture, I try to complement and enhance the texture and visual feel of my work in a way that reflects the conflicting beauty and multitude of layers that shape Modern Africa. My project title was Modern Africa – Sankofa. My work is inspired by the ancient symbolism of west African proverbs, more accurately known as Adinkra (pronounced Ad-een-kra). Sankofa literally means ‘go back and get it’. Adinkra is a collection of visual symbols, originally created by the Akan tribes of Ivory Coast and Ghana. The symbols represent concepts and aphorisms and are illustrated through proverbs. The symbols offer values and encourage actions that contribute to the making and sustaining of a harmonious society. Through these designs, I’m looking to bring new meaning to our contemporary living spaces. Are there any specific techniques and materials you prefer using? I’d describe myself as a screen printer; I find myself drawn to linen, suede and hessian. What was your inspiration for setting up your own Design Company? Modern Africa – Sankofa sits deeply in my heart and soul. The message it shares is just as important as its visual aesthetic. Both of these things combined, I believe, offer something that’s currently missing from the market. AMWA Designs is here to fill that void. Symbol meaning – Aya represents endurance and resourcefulness. It suggests overcoming adversity. We hear that you are taking part in the Milan Design Week- what can we look forward to seeing in your collection? I’m taking a lot of the Chelsea show with a few new twists. The collection offers a practical interpretation of Adinkra inspired design in a contemporary living space. Is there any advice you would give to our current Textile students here at Chelsea who will be embarking on their own careers later this year? Give it your all. And be true to yourself – in every way possible. Symbol meaning – Adinkrahene is said to be the chief of the Adinkra symbols. It signifies leadership and greatness. 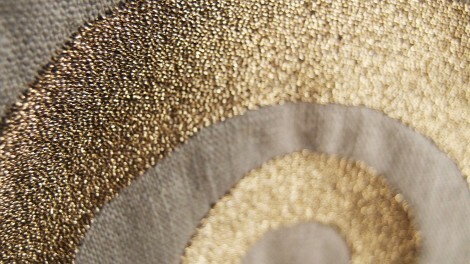 We can’t wait to see Chrissa’s collection at the Milan Design Week show – definitely one to watch. You can find more examples of Chrissa Amuah’s work on her website. Find out more about the Chelsea MA Textile course.